One of the most under utilized by anglers is appropriate eyewear. Major considerations would include protection from Ultra Violet rays and from any accidents when it comes to fishing tackle. They are a great tool to have with you as they allow for a clear view into the water by blocking out all the glare caused by the sun. Equally important is their use as eye protection while fishing. We will not guide or instruct lessons without their use. 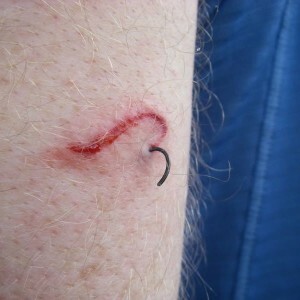 No matter how seasoned an angler, accidents happen, and winds are unpredictable – this could easily have been an eye! We have a fantastic selection so please don’t hesitate to contact the store for further details and availability.